26.03.2019- PaleoMoz Project featured in PalNews. An article about the PaleoMoz project 2018 expedition was published in the March issue of the Paleontological Society of Southern Africa (PSSA) newsletter. Feel free to read our (mis)adventures and findings from our 2018 fieldwork and learn much more about what is going on in Southern Africa paleontology. A small extract from our article in PalNews. The PaleoMoz Project is proud to annouce that Nelson Nhamutole and Zanildo Macungo are officially now master’s students at the University of Witswatersrand (South Africa) in collaboration with the Instituto Superior Técnico under the auspices of the PaleoMoz Project. The University of Witswatersrand is a partner of the PaleoMoz Project, it is the second-best university in Africa and the leading world institution in the research of the fossils from the Karoo, which are coeval strata to the Mozambican layers in the north of the country. Nelson and Zanildo will now follow the footsteps of giants such as James Kitching, Bruce Rubidge and others. Congratulations! The PaleoMoz project aims to create the first generation of paleontologists in Mozambique. 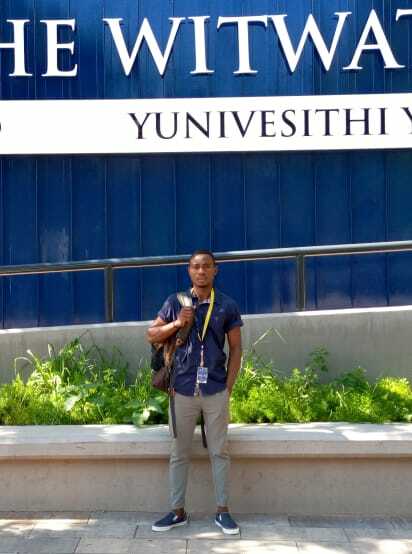 Zanildo Macungo in the first day of his Master’s Degree at Witwatersrand University. Nelson Nhamutole in the first day of his Master’s Degree at Witwatersrand University. 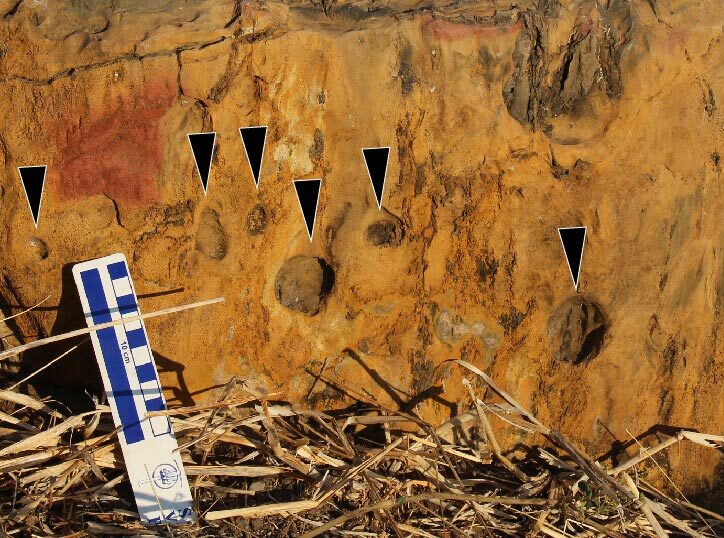 The fossil material collected in the PaleoMoz expedition is already being studied. We performed a series of micro-computed tomographies to observe the intricate details of the anatomy of various specimens collected in the course of the expedition. For that we counted with our long-term collaboration with the Institut des Sciences de l'Évolution de Montpellier at Université de Montpellier. A new Memorandum of Understanding was signed between the Museu Décio Thadeu e Alfredo Bensaúde (Portugal) and the Museu Nacional de Geologia (Mozambique) at the occasion of the XIII Jornadas de Santa Bárbara at Instituto Superior Técnico in order to enhance the scientific and training collaboration between institutions. We are happy that these institutions have now formalized their partnership, surely sparking further cooperation in the future. Learn more about the event here. We are happy to inform that we received another grant for the PaleoMoz project. With this grant we will continue to spread the aims and mission of the project: to promote and value the Mozambican fossil heritage and engage young people in science and technology. Hot off the press: our new paper had just come out. Tree hollows are depressions on the tree external surface that can have multiple origins. We found an incredible example in a fossil tree with more than 250 million years. Please check out the paper where we discuss the implications of these structures often elusive to paleobotanists. A screen shot of the paper published in Palaeontologia Africana. The extremely rare tree hollows on the side of the tree, thought to have resulted from fungal/bacterial decay of the wood. This year’s expedition was a tremendous success. New localities, new odd fossil vertebrates, (a lot) of fossil wood, new analysis. We walked more nearly 200km and drove nearly 9000km. We used boat, motorbike, pick up truck; we crossed two countries. This was the longest and one of the most adventurous expeditions we have ever done. Zanildo Macungo, Nelson Nhamutole, Ricardo Araújo, Dino Milisse and Steve Tolan made it happen! Paleontology students preparing fossils from Niassa at the National Paleontology Laboratory in Maputo. From the left to the right, Buanar Rashid, Gemusse Maganga, Ricardo Araújo, Zanildo Macungo and Steve Tolan after a long day of prospection. Dino Milisse participating in a fossil log excavation for examining the root structure of a +250Ma old tree. Camping in the bush after a long walk prospecting for fossils during the day. Ivânia Loide (second on the left) after defending her thesis brilliantly. She is the first Mozambican woman to have a scientific project in Paleontology. Neva Djimo (left) and Nelson Nhamutole (right) conducting a paleobotanical survey in one of the largest fossil forests in the world. Dino Milisse, Nelson Nhamutole and Zanildo Macungo presented a stand at the Agricultural, Commercial and Industrial Fair of Mozambique (FACIM) that happened from 27th of August to the 2nd of September in Maputo. The stand was visited by thousands of people and we had the opportunity to showcase our most recent findings. Zanildo explaining how we discover fossils in Mozambique to the general public. A general overview of the stand at FACIM 2018. We proudly announce that a Aga Khan / FCT grant has been awarded to the PalNiassa team of nearly 300k€. It is our intention to train the first generation of Mozambican paleontologists in areas as distinct as vertebrate paleontology to paleobotany. Our new project has the name PaleoMoz and will no longer be focused in the Niassa province, but rather in the entirety of the Mozambique country. Our project was presented to the sponsors of the project at the Ismaili Center in Lisbon on the 12th of July. Various people from the president of the Fundação para a Ciência e Technologia to the high commissioner of the Aga Khan Development Network were present. The PalNiassa team were present at the 15th International Paleontological Congress that happened from the 9th to the 13rd July in Paris. We presented about the largest fossil forest in Africa by the voice of Anne-Laure Decombeix, who is collaborating with us in this topic. The session in which it was presented was The Evolution of Tress and Forests. The Palniassa team completed a productive research trip to South Africa in June. We first visited Wits University (Johannesbourg) to analyse several wood samples and vertebrate specimens. Then we visited the vertebrate collection of the Council for Geosciences (Pretoria), and finally we examined unique specimens of Endothiodon at the Iziko South African Museum (Cape Town). We gave a seminar at the University of Cape Town and discussed with several colleagues about our project. We examined over 250 specimens, collected nearly 4000 images, 146 thin-section microphotographs, and identified 120 Mozambican fossils. To accomplished this, we travelled nearly 5,000km through beautiful South Africa. Nelson Nhamutole is currently doing an internship at the prestigious Stuttgard Museum of Natural History under a Rave Foundation fellowship. He is learning various curation, preparation and thin-sectioning techniques that will be paramount to his future research endeavours. Members of the PalNiassa team have been awarded a National Geographic Standard Grant to explore the post-extinction Triassic fauna and flora from the Niassa Province. This amazing opportunity will allow the researchers to refine the stratigraphy, pinpoint the end-Permian boundary, and find new vertebrate fossils from Mozambique. We are very proud that our work is endorsed by the prestigious National Geographic Society and that we are now part of their Explorer family! The international research team comprises Ricardo Araújo (project leader) and Rui Martins from the Instituto Superior Técnico (Portugal), Dino Milisse and Nelson Nhamutole from the Museu Nacional de Geologia (Mozambique), Kenneth Angielczyk of the Field Museum (USA), Jim Crowley from Boise State University (USA), Sterling Nesbitt from Virginia Tech University (USA), and Roger Smith of the Iziko Museum (South Africa). Once again the PalNiassa team was present at FACIM 2017, the Mozambique International Trade Show (28th of August to September 3rd) in Ricatla, Marracuene near Maputo. Thousands of people had the opportunity to see fossils collected in the province of Niassa during the PalNiassa expeditions. In this year's field expedition, PalNiassa paleontologists ventured into new territories in the Tete and Gaza provinces to prospect for new fossils. Amongst other discoveries, the team found many fossilised trees spread throughout an area of over 75km. This 250 million-years-old fossilised forest is the largest discovered in Africa to date. Also this summer, two new undergraduate students from the University Pedagógica da Beira (Beira, Mozambique), Sarita Gujula and Mussa Mamad, began their research training at the Paleontology Laboratory in Maputo. They have already learned techniques such as moulding and casting, photogrammetry and satellite imaging. We are excited that our team is expanding and delighted to welcome the first female Mozambican student to the project. From left to right: Ricardo Araújo, Zanildo Macungo, Nelson Nhamutole, Mussa Mamade, Nercia, Issaia Macaneta, Sarita Guluja. Nelson with a fossilised tree trunk during the 2017 expedition. 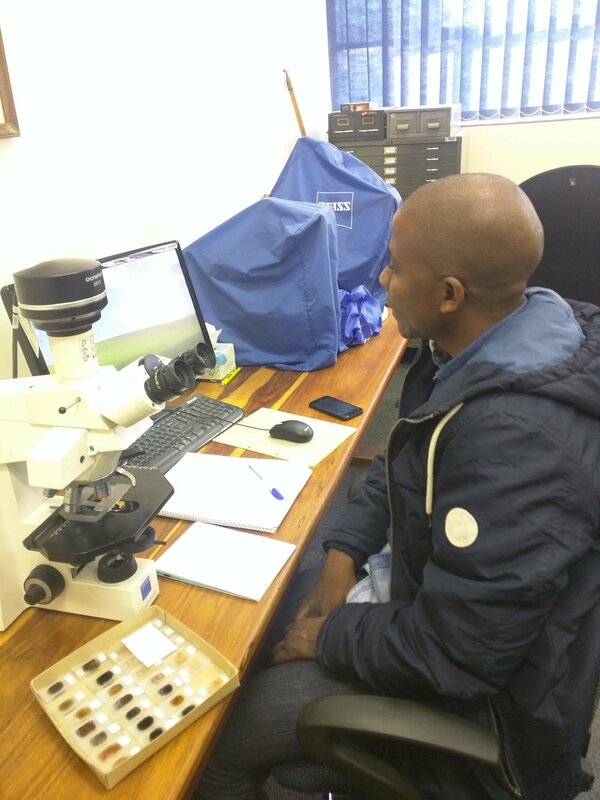 We are delighted that Nelson Nhamutole, head of the Paleontology Laboratory of the Museu Nacional de Geology of Mozambique, has recently been awarded an Alexander Rave Scholarship to do a research internship at the Stuttgard Museum of Natural History, starting in 2018. The director of the Museu Nacional de Geologia of Mozambique, Dino Milisse, visited several Portuguese research institutions (1st to 9th July) with the aim of strengthening existent collaborations and fostering new partnerships for the PalNiassa Project. Several Mozambican fossils that were temporarily kept at the Museum of Lourinhã during the construction of the Paleontology Laboratory in Maputo were also returned to Mozambique. A new partnership was established with the Museu Décio Thadeu and the Museu Alfredo Bensaúde of the Instituto Superior Técnico. Preparing the fossils at Lourinhã Museum for returning to Mozambique. Visit to the Museum Décio Thadeu and Museum Alfredo Bensaúde. The PalNiassa team has recently published two research articles in prestigious peer-reviewed journals. The first study, which was led by Ricardo Araújo and was published in PeerJ, explores several aspects of the paleobiology of gorgonopsians. This work was featured in several Portuguese media outlets such as Diário de Notícias, Jornal de Notícias and SIC Notícias, amongst others. Another study was recently published in Scientific Reports and was led by Sérgio Ferreira-Cardoso, a PhD student who assisted in the 2015 PalNiassa field expedition. In this study, the dicynodont Niassodon mfumukasi is amongst other species analysed to describe the anatomical diversity of the flocculus, a region of the "reptilian" brain. This study was also featured in a Portuguese newspaper. Both these studies are open-access and can therefore be consulted by any researcher or member of the public. Reconstruction of a gorgonopsian (copyright Fernando Correia). Staff from the PalNiassa partner Museu Nacional de Geologia (Mozambique), including Sérgio Matsinhe, Marta Munde, Carla Guente, Issaia Albino and Zanildo Macungo, recently represented the museum and the PalNiassa project at the second edition of EDUCA Mozambique: International Education Fair and Conference organised by CADE (Comunidade Académica para o Desenvolvimento) from the 1st to the 7th of May 2017 in Maputo. The theme for this event was "Women and Youth Empowerment through STEM (Science, Technology, Engineering and Maths) as a basis for sustainable socio-economical development of Mozambique". The fair had over 50 thousand participants and about 150 representatives from all over the world. Our team presented a stand with samples of fossils and minerals, and posters about the importance of the geological and paleontological heritage of Mozambique. Fossil and geology specimen exhibition from the Museu Nacional de Geologia. PalNiassa/Museu Nacional de Geologia stand at the EDUCA Mozambique: International Education Fair and Conference. Nelson Nhamutole, curator at the National Museum of Geology (Maputo) and head of the new Paleontology Laboratory, gave a seminar to over 200 Biology undergraduate students of the University Eduardo Mondlane earlier this month. 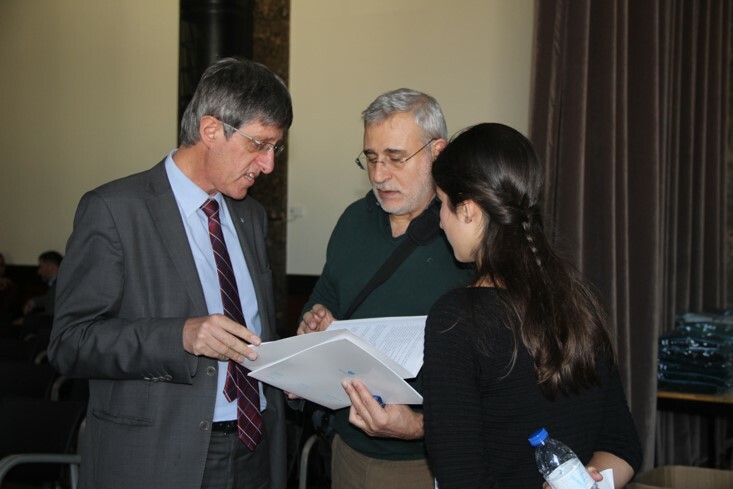 He introduced the PalNiassa project to the students and presented the latest fossil discoveries. Science outreach activities such as these are fundamental to disseminate the PalNiassa project and the work of the National Geology Museum, and therefore to protect the rich paleontological heritage of Mozambique. An article about the PalNiassa project was published in the February issue of the Paleontological Society of Southern Africa (PSSA) newsletter. The PSSA was founded in 1979 with the aim of advancing the science of palaeontology in Southern Africa by facilitating the cooperation between every person interested in the study of evolution, comparative anatomy and taxonomy. PalNiassa scientists are members of the PSSA and actively engaged in its activities. The PSSA and the PalNiassa project share important goals: conservation and preservation of fossil sites and promotion of the paleontological heritage in Africa. Nelson Nhamutole, Albano Nhassengo and Zanildo Macungo presented the Project PalNiassa in a seminar at the "Promoting Geosciences to the Society" workshop organised by the Young Earth Scientists Network (YES Network) in Namaacha, Mozambique. The YES Network is an international association of early-career geoscientists from across the world. Albano Nhassengo speaks about the Mozambican geological heritage. YES Network workshop (Namaacha, 2016) attendants. 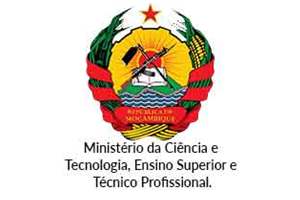 The Portuguese Secretary General of the Ministry for Science and Technology, Maria Fernanda Rollo, visited the National Geology Museum of Mozambique during her official visit to Mozambique in October. The Director of the museum, Dino Milisse, had the pleasure of showing her the Musem collection and presenting the PalNiassa Project, as well as discussing future collaborations. Nelson Nhamutole and Dino Milisse present the PalNiassa Project to Maria Fernando Rollo. Dino Milisse shows the fossil collection of the National Geology Museum to Maria Fernando Rollo. 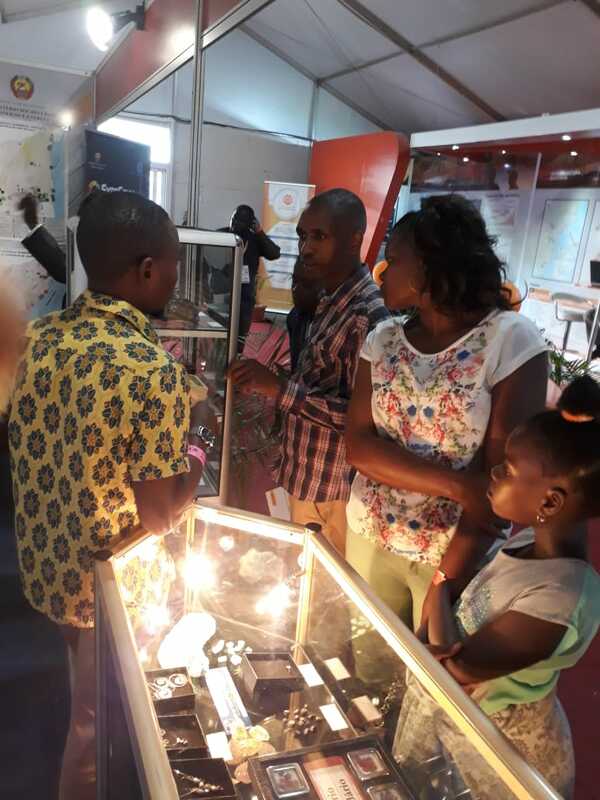 Nelson Nhamutole and Zanildo Macungo presented a stand at the Annual Fair of Nacala (FAGENA), which is organised by the Direcção Provincial de Recursos Minerais of Nampula. The stand was visited by over hundred people from geologists to members of the public, and with a special visit by the Governor of Nampula, Victor Manuel Borge. Zanildo Macungo presenting fossil specimens to the Governor of Nampula. 23.08.2016- PalNiassa in the news! The Portuguese newspaper Público published an in depth article by Teresa Firmino about the PalNiassa project and the conclusion of the first development phase of the Paleontology Laboratory in Maputo. In the article, Ricardo Araújo emphasises the important role of the laboratory in providing research training in paleontology to Mozambican students: "Currently, students from Universidade Pedagógica da Beira can do internships in the laboratory, and soon geology undergraduates from the University Eduardo Mondlane will have practical classes here. In the future, the laboratory will also be open for visitors, who will be able to see fossils and learn about the amazing Mozambican paleontological heritage." You can read the entire Público article here (in Portuguese). Nelson Nhamutole, Dino Milisse and Ricardo Araújo have initiated the fossil preparation activities in the new temporary Paleontology Laboratory in Marracuene (in the outskirts of Maputo), thus completing the first phase of this project. In the second phase, this temporary laboratory will be moved to a new building that is currently under construction. Brand new equipment for fossil preparation was set up and Nelson Nhamutole, Head of the laboratory, received laboratory management and technical training. Students from the University Eduardo Mondlane, Albano Nhassengo and Zanildo Macungo, received training in fossil preparation and are currently working in the laboratory as preparators. Estela Cuambe had a determinant role in managing the logistics and financing of the laboratory construction. We thank Matt Brown, Alexandra Tomás and Mike Polcyn for helping with the first architectural draft of the fossil preparation lab designed by Ricardo Araújo. It is now becoming a reality! The Paleontology Laboratory was inaugurated. From left to right: Zanildo Macungo, Issaia Macaneta, Ricardo Araújo, Nelson Nhamutole and Albano Nhiessengo. Zanildo preparing a fossil at the Laboratory. The PalNiassa team has released an animated movie created by artist Edel Truda under the scientific direction of Ricardo Araújo in tribute to Luís Costa Junior, former Director of the National Geology Museum (Maputo) and co-founder of the PalNiassa project. Luis Costa Junior sadly passed way in 2015. This beautiful movie aims to capture the essence of the PalNiassa project and the passion of Luis Costa Junior for preserving the geological and paleontological heritage of Mozambique. Congratulations to Zanildo Macungo and Albano Nhassengo for successfully defending their theses! As part of their geology undergraduate degree at University Eduardo Mondlane, Zanildo and Albano spent one year studying Endothiodon material collected during PalNiassa field expeditions. PalNiassa paleontologists supervised their research work and the preparation of their theses. From left: Estela Cuambe, Zanildo Macungo, Albano Nhassengo and Nelson Nhamutole.